Our newest member of Apollo Law is Ms. Chelsea Fitzpatrick. 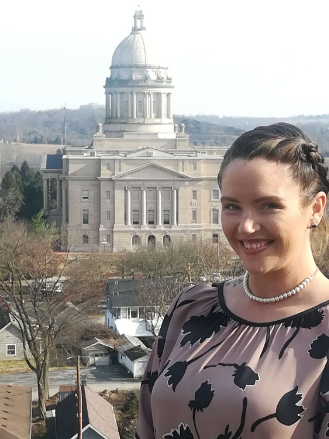 Chelsea was born on April 18, 1987 in Lexington, KY. She was raised in Frankfort, but graduated high school from Anderson County in 2005, and now is back and residing in downtown Frankfort. After high school, Chelsea attended Bluegrass Community and Technical College for relatively two years, focusing on accounting and computer programming. Chelsea has had 10+ years’ experience in the business administration field, she is proficient with Microsoft Office suite including Word, Excel, and PowerPoint, and skilled in a variety of word processing programs making her an excellent typist. In her down time, Chelsea loves spending time with her two children, Kaden and Olivia, playing the piano, cooking, and being around friends and family. Chelsea plans on continuing her education and is excited to be starting a new journey with Apollo Law.